May. 11, 2013 3:00 p.m.
Stephen Palmer recently brought his folksy, one-man guitar extravaganza to St. Matthew's Lutheran Church in Thorsby for the 2013 Spring BBQ fundraiser. During the British Invasion of the '60s and '70s, Palmer's band opened for such notables as The Who, Eric Clapton and Led Zeppelin whenever they came to Edmonton. Every year, the ladies of Thorsby’s St. Matthew’s Lutheran Church faithfully hold a Spring BBQ fundraiser. But this year, they decided to kick it up a notch and bring in a troubadour. When Church Elder Robert Krueger heard that Palmer was the “best on the house concert circuit,” he thought Palmer might be a nice fit. The proceeds from the Spring BBQ fundraiser, held this year on April 30, are earmarked for evangelism and social ministries. After a delicious BBQ, 125 guests enjoyed the Stephen Palmer concert. Stephen Palmer, guitarist/singer-songwriter, has a passion for old folk music—his style has been compared to a little bit of Lightfoot, a little Stompin’ Tom, Cohen and Cash. He describes it as a smorgasbord of fancy guitar, ragtime and old folk music. After cutting his teeth on gospel, country and blues…developing a solid Travis-style alternating base…nimblin’ up his pickin’ fingers by emulating the award-winning guitarist Doc Watson…and throwing in a bit of Carter style too, Palmer was ready for the psychedelic folk-rock scene of the ‘60s and ‘70s. From the time he was 15 until he was 19-years-old, he and his band mates were honored to open for the British Invasion—The Who, Eric Clapton, and Led Zeppelin and many others—when they came to Edmonton. As you can imagine, it was quite an experience for one so young. After sharing a dressing room with members of such renowned bands, Palmer got to know these guys pretty well. Despite their crazy guitar and drum smashing notoriety, Palmer says that off-stage The Who were “amazingly tame.” In fact, some Edmonton high schools were privileged to have The Who show up impromptu for dances or events because of their close connection with Palmer and his Edmonton band mates. They were generous with their time and talent. Unfortunately, he didn’t share a dressing room with Led Zeppelin so there are no behind-the-scenes stories there. 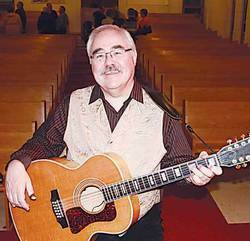 Palmer went solo in the ‘70s and has spent the last forty years travelling as a self-described “Country Roots” musician, backing himself on 6 and 12 string guitars. Though born and reared in Edmonton, he now calls Moose Jaw, Saskatchewan home. Guests were treated to a two-hour long sampling of folk music: an “Oh, Susannah” sing-a-long; some instrumentals including Palmer’s own catchy “Jackalope Ramble”; a little ragtime; a song with a noticeable Beatles-influence; Vera Lynn’s “We’ll Meet Again” and the old English (or Celtic, or Scottish, depending….) “The Water is Wide” and so many more heart-felt folk songs that make Palmer’s concert a heart-singing experience. “Grumpy biker” Bob once urged Palmer to not “waste” his life in music, but to “get an education.” Anyone who has ever heard Palmer in concert will certainly tell you his music is toe-tappingly uplifting and joyful. Guess "grumpy bikers" don’t know everything about a wasted life as any of the St. Matthew’s Lutheran Church Spring BBQ attendees will testify!